Have you ever had the "why didn't I think of that!" moment? And have you ever known a child in his or her mother's arms that doesn't reach for her bright shiny necklace? Enter Chewbeads! 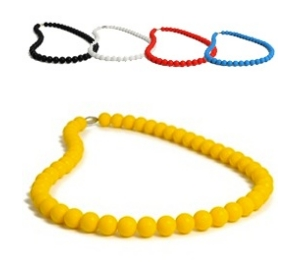 Made from 100% food-safe silicone and free of BPA, PVC, Phthalates, Cadmium and Lead; you can rest easy when baby chews on these necklaces. Soft on babies teething bums, breakaway clasp and dishwasher safe. File under: Functional Fashion.